The dark chocolate in these is very, very good, and the other thing I like about them is the texture. The outer chocolate coating seems different to me than other brands. Thinner or softer or both, you don’t bite in and have it crack. It’s more at one with the filling – distinct enough, but not two vastly different textures. The other thing to know is that these pieces are little. They’re so intensely dark that I still often eat only half at once, but I am weird that way. Be advised that this is about quality, not quantity. If you’d feel ripped off by something delicious because it doesn’t come in a large piece, go elsewhere, and also, you are not my friend anymore, OK? These chocolates are handmade, and you’re advised to eat them within two weeks. Which is pretty funny advice, in my opinion. There is no way they last more than a few days at my house. This box came with two flavors of mice. 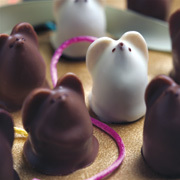 One is a white mouse with a cinnamon chocolate filling. It’s very cinnamon, and although the description says dark chocolate, it seems like milk to me. And did I say, very cinnamon? 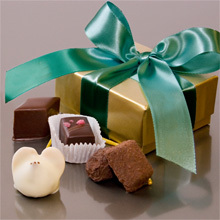 The white chocolate is a very thin layer, not enough to affect the flavor much, but enough to make it sooooo cute. In the dark mouse, the filling was whipped in texture, unlike any of the others. It’s supposed to be cherry, but a cherry flavor was not very noticeable. But come on. The chocolate is great and they are cute, so who cares? After biting the heads off the mouses and gobbling them up, we turn to the more normally shaped bonbons. Baton Framboise – Dark chocolate raspberry. I’m not that big a fan of this combination, although I know it’s very traditional. But when I’m thinking I ought to order a box of Burdick, this is the flavor I am dreaming of. I don’t know how they make this so intensely raspberry and still have room to make it so dark chocolate. Are there really enough flavor molecules in this tiny piece of chocolate to do both? It’s magic. Hazelnut – The description says combination of milk and dark, but this one seems like milk. Go figure. I know some people swoon for chocolate hazelnut, but normally I will not go out of my way to eat something this flavor. But this is soooo goooood. There’s a tiny bit of crunchy nut texture, but mostly smoothness, and so flavorful of hazelnut I’d almost call it aromatic. If you actually were a fan of chocolate and hazelnut, I wonder, would you be able to stand it? Honey Caramel Truffle – There’s always more than one of these in each box. I eat the first one and like it, it seems caramelly, but when I get to the second, I remember that these taste too much like honey, which I don’t think is a good combination with chocolate. I can’t quite explain it. There is obviously something wrong with me here, and you’ll have to try this for yourself. Lemon Spice Milk Chocolate with Rum – Maybe too many things are combined here, because none of the flavors stand out. I would not have guessed it was lemon, except that there is a bright sort of citrus tang to it. It’s good, but would be better with dark chocolate. Lemon Pepper Truffle – Whoa, now this one is LEMON. I’m not going to tell you how good this is, so you’ll leave it for me. Jaffa – Dark chocolate with orange. I don’t like orange with chocolate that much, but I have always liked this one. This time it seems much milder than I remember. Which is less offensive if you don’t like orange with chocolate, I guess. The dark chocolate is good enough that this is happymaking either way. Fig – Like the hazelnut, says it’s a milk and dark chocolate interior, but this one seems like dark. Whatever. I don’t really taste the fig or the alleged port wine, but there are little tiny crunchy fig seeds, so they’re not lying. There was a difference of opinion over whether the piece of dried fruit on top was a fig; in the end we pronounced it a golden raisin. Chocolate Covered Cocoa Bean – This is a new one, and quite a surprise to bite into, since it looked like one of their truffles. Very crunchy and of course very dark and not very sweet. Along with the mice, this is something I’ve not seen in any other brand. In my opinion, this is the brand to try if you are a big fan of dark chocolate, and if you like the idea of a chocolate coating that isn’t too hard. And if you can’t stand how cute those those little mice are. And, let’s be honest, if you have a lot of money. But this is one where I always feel like I got my money’s worth. If you’re near their store in Harvard Sq, Cambridge, MA, USA you need to stop in for their hot dark chocolate (or have it iced!) – it’s amazing! You can mail-order the shaved chocolate they use to make the hot chocolate at their cafe. It is the best I have had.